1. Was the main goal of the newly elected President Lincoln to end slavery, or save the Union? 2. Explain the purposes of the 13th, 14th and 15th Amendments to the Constitution. 3. Who was your favorite military figure from the Civil War, and why? 4. How would you have handled Reconstruction differently? 5. Abraham Lincoln was homeschooled. Do you see any characteristics in him that might have reflected his homeschooling, such as his independent thinking? 6. Please interpret the cartoon about the dream to the right. Its title is "Abraham's dream!--'Coming events cast their shadows before.'" 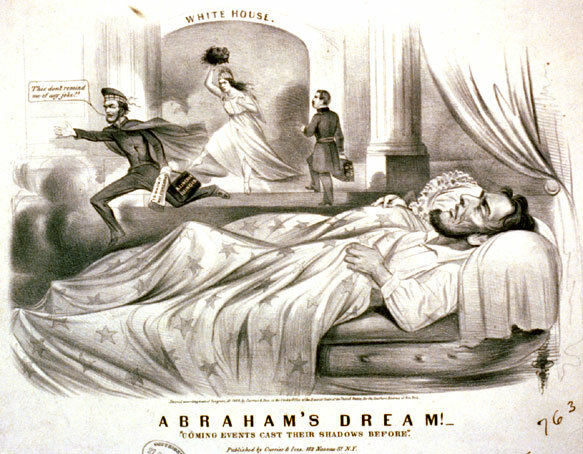 Lincoln is fleeing to left while wearing a Scotsman's plaid cap and a cape. He declares, "This don't remind me of any joke!" 7. Please interpret the cartoon with Columbia below. The caption is, "The Chinese Question." Columbia says, "Hands off, gentlemen. America means fair play for all men." H1. Which do you prefer, inflation or deflation? In your answer explain whether deflation or inflation is encouraged more by "hard money" (a gold standard for money). H2. Free enterprise after the Civil War: a good or bad thing? H3. Write about any issue or debate from the time period of 1860-1876. H4. Andrew Johnson: misunderstood or incompetent? H5. Your view of Abraham Lincoln, please. This page was last modified on 11 July 2016, at 22:07.